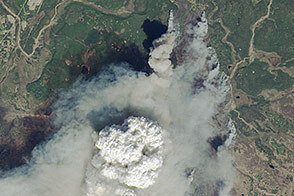 Today’s image is the answer to the May puzzler. Though it looks like it could be a thin slice of mineral-speckled rock viewed through a microscope, this image was actually acquired by a satellite orbiting 705 kilometers (438 miles) above Earth’s surface. 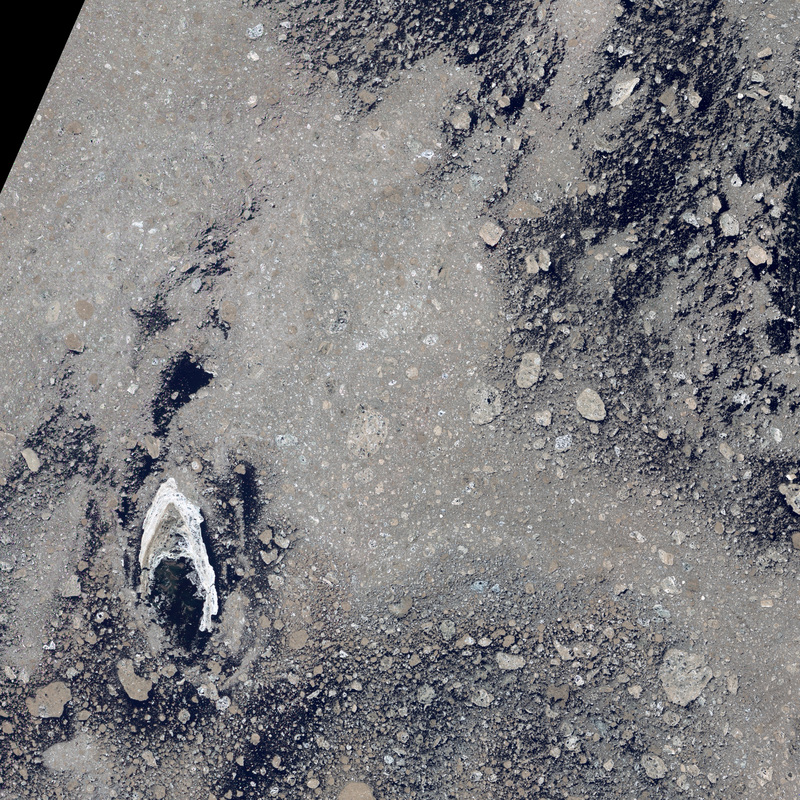 When the Advanced Land Imager (ALI) on the Earth Observing-1 satellite captured the image on July 26, 2012, the sensor was pointed at a small set of islands in Foxe Basin, the shallow northern reaches of Hudson Bay. Look carefully and you should be able to pick out Canada’s Manning Islands in the lower left, just south of the white hook-shaped feature. The islands are located at 68.797 degrees North latitude, 80.037 degrees West latitude, which puts them about 30 kilometers (19 miles) southwest of the much larger Rowley Island (not shown). Ocean currents bring cool, nutrient-rich waters to Foxe Basin and promote the abundant growth of phytoplankton in the waters around the islands. The phytoplankton sit at the center of a food web that supports populations of arctic terns, seals, walruses, and polar bears that periodically use the island. Narwhals, bowheads, and beluga whales all frequent the waters surrounding the island in the summer. The closest settlement is Hall Beach, an Inuit town about 45 kilometers (28 miles) to the west that is home to a military base, airport, and college. Sea ice is the most dominant feature in the image. 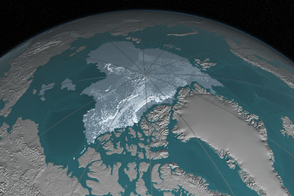 According to Nathan Kurtz, a sea ice researcher at NASA Goddard Space Flight Center: “This appears to be multiyear sea ice at the end stage of melting.” Kurtz could tell it was multiyear ice (rather than first-year ice) by checking a data archive maintained by EUMETSAT’s Ocean & Sea Ice Satellite Application Facility. On July 5, 2012, before the melt season began, satellite observations showed the area was covered with multi-year ice. By July 20, the satellites showed melting was in full swing. By August 2, there was very little ice left in the area. The small size of the ice floes and the fact they came in a range of sizes also indicate melting. 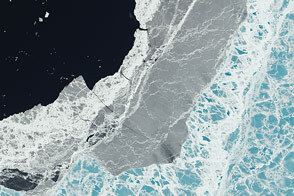 ”You tend to see small, distinct floes like this at the ice edge due to wind and wave action. This doesn’t happen in the middle of a large expanse of pack ice because thick sea ice blunts the impacts of waves. You also see floes of many sizes near the ice edge because patches of open water near the edge are dark and absorb light readily, which causes lateral melting,” he said. The darkest colors in the image are open water. Snow-free ice appears gray, while snow-covered ice appears white. 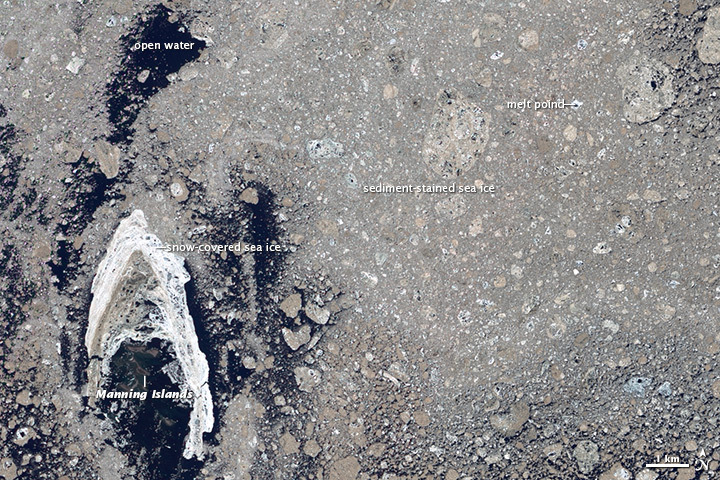 Foxe Basin sea ice is known for having an unusual brown color due to staining from sediment. Unlike sea ice in other parts of the Arctic, land surrounds the basin and sediment sources are never far away. Also, the basin is shallow enough that its waters are often rich with marine sediments kicked up from the ocean floor. As is clear from this image, snow is unevenly distributed across sea ice. It tends to accumulate in areas where the ice is thick, rough, and ridged, which protects it from melting during the summer. “One of the most striking features—the curved white area in the lower left—was probably caused by snow getting trapped in rough, ridged ice that formed as it ran up against the Manning Islands,” explained Kurtz. The small, dark features on many of the floes are likely melt ponds. Most years, this area would have been blanketed by a much more continuous layer of pack ice in mid-July—not the pockmarked ice seen here. 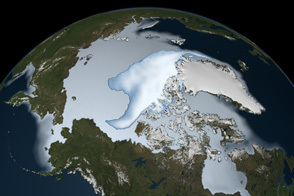 However, the melting and breakup of Arctic sea ice was unusually extensive in 2012, a year that holds the record for the lowest ice extent in the satellite era. During a more typical year, the edge of the pack ice would have been hundreds of kilometers to the south, closer to Southampton Island. 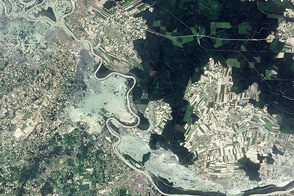 NASA Earth Observatory image by Jesse Allen, using EO-1 ALI data provided courtesy of the NASA EO-1 team. Caption by Adam Voiland, with information from Nathan Kurtz and Walt Meier. Congratulations to Owen Anfinson and Laura Yeo for coming close to solving the puzzler. Sea ice from the Foxe Basin tends to be rougher and more stained than other parts of the Arctic. Martini, I.P. (1986, January) Canadian Inland Seas Chapter 12: The Physical Oceanography of Foxe Basin. Campell, N.J. (1958) The Discoloration of Foxe Basin Ice. Journal of the Fisheries Research Board of Canada, 15 (6), 1175-1188. Accessed May 22, 2014. 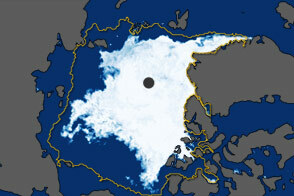 Earth Observatory Arctic Sea Ice. Earth Observatory (2009, April 20) Sea Ice. Earth Observatory (2012, September 27) Visualizing the 2012 Sea Ice Minimum. Government of Canada Manning Islands. Accessed May 22, 2014. National Snow & Ice Data Center Multiyear Ice. Accessed May 22, 2014. Nunavut Department of Environment Nunavut Coastal Resource Inventory. Accessed May 22, 2014.